Review by Karen Topham, American Theatre Critics Association member; photo by Nick Roth. America was founded, despite current political rhetoric, by immigrants who capitalized on opportunities to uproot themselves and move across an ocean to a new land. We haven’t rested since. Part of what became the American Dream has always involved the freedom to move. From the settling of the old west to the modern superhighway system, America has always been a country of travelers moving from place to place. The age of the automobile, of course, made this a lot easier, and nowadays one’s car is, as much as one’s home, the center of life. This might explain why a group of people in 1995 chose to enter an endurance contest sponsored by a Longview, Texas car company to try to win a new truck by keeping their hands on it longest. We’re talking days here: the contest lasted 77 hours and was a very popular event, attracting crowds of spectators who wanted to see someone ultimately win something for nothing. In 1997, a filmmaker named S.R. Bindler made a documentary about the contest, and in 2011 the movie was turned into a musical by Pulitzer Prize-winning playwright Doug Wright with music by Trey Anastasio (of Phish) and Amanda Green, and it had a brief Broadway run in 2013. 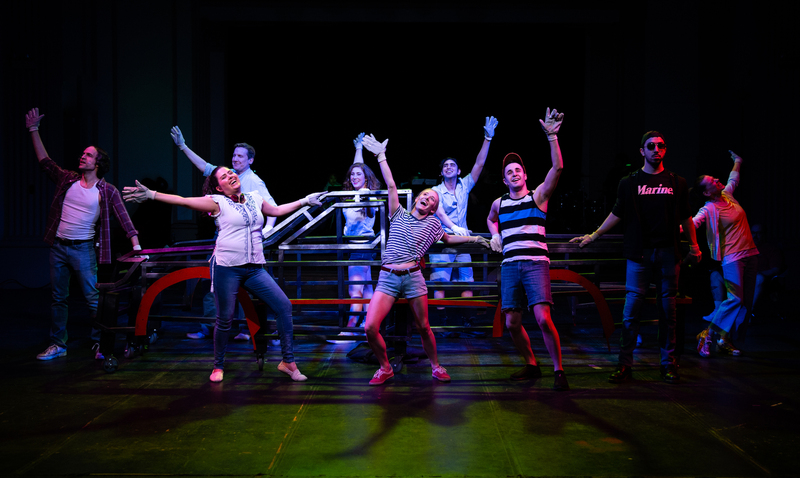 Aside from a Crystal Lake production in 2014, Hands on a Hardbody had never played the Chicago area until Sunday night, when Refuge Theatre Project opened its Chicago premiere of the show in the cavernous performance space on the fourth floor of the Preston Bradley Center. There is much to like about this show, starting with the direction of Christopher Pazdernik. It is a challenge to put on a show in which the ten major cast members have to spend pretty much the whole time in the center of the stage touching a truck, but Pazdernik (along with choreographer Ariel Triunfo) is able to vary the stage picture enough that, though it sometimes feels repetitive, it is never boring. (He has help from an Evan Frank scenic design that uses not an actual truck but a see-through skeleton that rotates to change perspectives.) Pazdernik is also able to pull interesting and dynamic performances out of each member of his cast, all of whom have at least one song that allows us to see why they are doing this and where they come from. It’s these songs that make or break this musical, and Anastacio and Green have composed some wonderful and powerful pieces in styles ranging from country ballads to gospel. The songs, sung by a cast that is in top vocal form, were marred on opening night by issues with the sound system ranging from mics that failed to static and feedback, an unfortunate situation that may well be rectified by this weekend’s performances. They are also hurt by the space itself, as this large concrete-walled auditorium is not designed for musicals. Other contestants include Ronald (Jared David Michael Grant), who tries to use Snickers bars to keep his energy up. (Note to all considering this: fifteen Snickers plus 100° heat might not be good for you.) His song, “My Problem Right There,” is wonderful, but it’s clear he isn’t long for the contest. Norma Valverde (Cathy Reyes McNamara) is a young woman who believes that God will help her to win. Janis (Katherine Condit) is an at times abrasive woman who watches like a hawk to see if anyone is cheating. Chris (Max Cervantes) is an ex-Marine who maintains a hard silence while others are chatting to pass the time. Jesus (Sebastian Summers) is a native Texan of Mexican descent who is forced to deal with others’ prejudices and comments. His “Born in Laredo” is a powerful indictment of that mentality. The final contestant is Heather (Molly Kral), who has secretly been promised the victory by dealership manager Mike (Dan Gold) because she would look great in ads. Kral and Gold have a rocking duet about the problems that could arise from cheating (“Burn That Bridge”). Other characters are Cindy (Jenna Fawcett), the sales manager for the dealership, JD’s wife Virginia (Judy Lea Steele), Janis’s husband Don (Anthony Whitaker), and a radio personality played by Matt Patrick. As the contestants drop one by one, we learn of their motivations (Jesus wants to sell the truck to pay for a veterinarian degree, Norma wants something to be able to drive her kids around in, etc.) and their personalities. We also see the toll that exhaustion is taking. Several contestants simply succumb. But there are others who give up for one reason or another, and these are sometimes less realistic: if you’ve set yourself up to do this thing and you’ve been at it for more than two days without your enervation breaking you down, why would you leave because of, say, an emotional epiphany? Sometimes it just feels that the contestants are leaving because, well, if they don’t then the play will never end. And that is part of the problem here: with this many contestants and the need to showcase them all, the musical ends up lasting at least twenty minutes too long to sustain its narrative. (Of course, that might also be due to the less-than-comfortable, far-too-tightly-packed seating.) Wright smartly cut it down to ten contestants from the 24 in the documentary, but maybe a couple more cuts wouldn’t have hurt. Hands on a Hardbody is hard not to admire. It is full of strong performances, especially Fawcett, who is excellent as the man you want to hate, and all of the actors fully inhabit their characters. The four-piece band is solid. Wright’s script and Anastacio/Green’s songs are full of droll commentary on life in modern America. (One character notes that Longview has three Walmarts, a sure sign of progress.) Pazdernik has done everything he can within the obvious limitations of the set to keep it alive and interesting. And the music is memorable and varied. What keeps this from being a more unmitigated recommendation is that sound system that is far from perfect and the space too outsized. Still, if you can deal with that, you should enjoy Hands on a Hardbody. Hands on a Hardbody is now playing at the Preston Bradley Center, 941 W. Lawrence Ave, through April 27. Check the website for specific dates, times, and tickets. Find more information about current plays in our front page recs and attheatreinchicago.com.